Butterflies are highly fragile organisms with diversified habits, and require specific ecological conditions for survival. Natural forests, grasslands, canopies of trees as well as wet areas along the banks of rivers and streams are the typical habitats of butterflies. Habitat loss, commercial collection, and incidence of parasites and predators are the major threats for the survival of butterflies. It has been stated that extinction of a single species would eventually lead to extinction of about a dozen or more species that are linked with it, which in turn, can affect the functioning of natural ecosystems. Management and conservation of butterfly fauna are practiced by in–situ and ex–situ methods. In the former, the natural habitats are enriched through introduction of suitable butterfly host plants, while in the latter, stocks of butterflies are maintained through captive breeding and are reintroduced into the suitable habitats. Habitat enrichment can boost local butterfly fauna for in–situ conservation (Heal 1973). The role of butterfly farm (garden) for ex–situ conservation and for promoting environmental education is well recognized (Newman 1967). 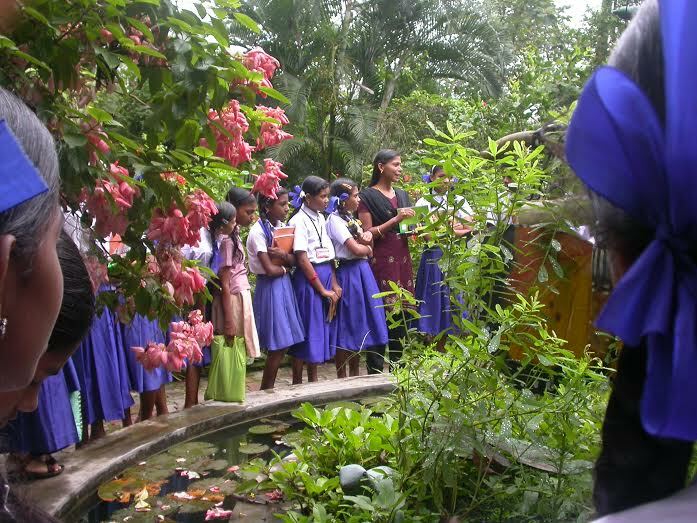 A prototype of the garden was set up in a 0.5 ha patch of degraded deciduous forest in the Kerala Forest Research Institute campus at Peechi, mainly to standardize methodologies for establishing such gardens elsewhere in Kerala (Mathew 1998 & 2001). The vegetation of this area included a few trees of Bombax malabaricum, Ailanthus triphysa, Tectona grandis, Grewia tiliaefolia and Terminalia bellerica along the slopes. The terrain was undulating and hilly in nature comprising of steep slopes and with a more or less plain ridge, which was mostly barren and devoid of trees. There was good ground vegetation mostly comprising of Lantana camara and Chromolaena odoratum. Foraging and breeding are the important activities of butterflies, and hence, due consideration was given to the habitat preferences of various groups of butterflies while designing the components of the garden. Openings with bright sunshine, shade, lianas, damp areas and hedges were set up. Plants introduced in the garden included nectar plants such as Ixora species, Cassia species., Allamanda cathartica, Hibiscus rosa–sinensis, Cuphea miniata, Zinnia haageana, Marigold, Mussaenda luteola, M. laxa and Clerodendrum capitatum as well as larval host plants such as Michelia champaca, Cinnamom zeylanicum, Zanthoxylum rhetsa, Aegle marmelos, Citrus aurantia, Wattakaka volubilis, Thottea siliquosa, Tylophora indica, T. camosa, Asclepias species, Calotropis giganteum, Carissa carandus, Ruta graveolens, Aegle marmelos, Albizia lebbeck, Cassia species, Murraya koenigii, Kalanchoe blossfieldiana and K. pinnata. Regular monitoring of butterfly populations was carried out by making transect counts during June 1998 to November 2000 to evaluate the effect of habitat enrichment. The number of species and individuals of butterflies sighted in the garden along with data on weather parameters such as temperature, humidity, and rainfall were noted. The monthly seasonal index of butterfly citation was used as an index to compare the population trends of butterflies. 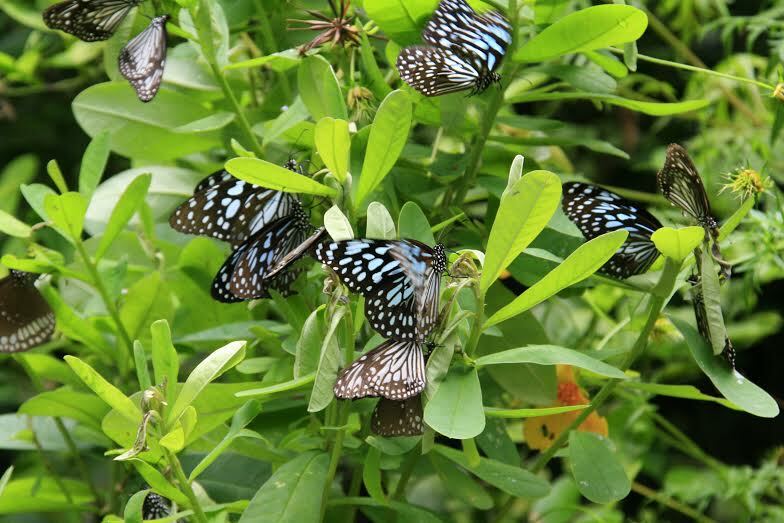 As a result of introduction of appropriate larval and adult host plants, there was sharp increase in the number of butterflies visiting the area. During the first half of this study (after 15 months), there were 4509 sightings of individuals belonging to 43 species. During observations after 30 months, 5993 sightings of individuals belonging to 50 species of butterflies were made. At the end of 36 months, 23 additional species of butterflies were recorded. Thus, the total number of species of butterflies spotted in the garden was 73, compared to a dozen species recorded prior to the introduction of host plants. The butterflies recorded in this study included eight species endemic to Western Ghats and 10 species having protected status under the Wildlife (Protection) Act of Government of India (GOI 1972) and subsequent amendments. Several butterflies that are fond of bright sunshine such as Troides minos, Papilio demoleus, P. polytes, Pachliopta hector and Pachliopta pandiyana (Papilionidae), Catopsilia species and Eurema species (Pieridae); Jamides species, Talicada nyseus, Castalius rosimon and Everes species (Lycaenidae); Euploea core, Tirumala limniace, Danaus genutia, T. septentrionis and Parantica aglea (Danaidae) as well as Junonia hierta, J. altites, J. iphita, J. precis and Hypolimnas misippus (Nymphalidae) are found in open habitats. Among them, danaids formed large aggregations with populations ranging from 100–200, on Crotalaria retusa and Heliotropium keralense. These plants are known to contain pyrrolizidine alkaloids, essential for the development of pheromone–producing glands (Ackery and Vane–Wright 1984). The area having tall native trees providing cool shade mixed with sunlit patches offered favourable habitats for several papilionids (Papilio buddha, P. polymnestor, P. helenus, P. paris, Troides minos, Pachliopta pandiyana and Chilasa clytia), which were observed to fly rapidly amid bushes and treetops frequently feeding at the flower–heads of Clerodendrum paniculatum, Mussaenda and Ixora species. The cool, shaded areas amid dry leaves are occupied by satyrids (Orsotrioena medus and Melanitis leda). Rearing of butterflies and moths has been in practice since long for commercial and conservation–oriented programmes (Morton 1991). During the 19thcentury, collection of butterflies became a serious vocation for many people in the West, which led to the collection, identification and cataloguing of butterflies. Subsequently, butterflies were maintained in glass–houses and opened to the public as butterfly houses. Although butterflies have high fecundity, this potential is hardly realized under natural conditions. Because of the natural mortality factors due to unfavourable climatic conditions (drought, wind, temperature etc.) and incidence of parasites and predators, survival rate of the butterflies in the wild is estimated to be only around 2%. However, by shielding butterflies from such adverse conditions, a successful butterfly farmer will be able to enhance the survival rate as high as 90%. As compared to vertebrates, butterflies require only little space for farming, and they reproduce rapidly. Most commercial butterfly–houses are of walk–through heated glass–house type which is expensive to construct and maintain. Such ‘free–flight’ butterfly–houses are very common in Europe, North America, Japan, Australia, Singapore, Malaysia, Hong Kong, and Kenya. However, such technologically–sophisticated structures and capital requirements are not necessary in tropical conditions. The technological simplicity of butterfly farming, therefore, minimizes the strain on under–developed or developing countries to establish butterfly–breeding and farming programmes. Butterfly–breeding techniques are also relatively simple, which can be readily conveyed to the farmer with simple demonstrations. Tropical butterflies require daytime temperature of 25°C and 85%–95% relative humidity. Some tropical species require almost 100% humidity to mate. Night temperature can drop to around 15°C. Butterflies should have access to moist sand, for which spraying the ground with a mist of water is the most–suitable way. Many of the butterflies need to bask under radiant heat sources to bring their body temperatures up to 32°C–35°C for oviposition. Appropriate larval host plants should be provided in the cage. Eggs laid should be surface–sterilized by treating with 0.1%–0.2% sodium hypochlorite (up to 10 min) or 10% formaldehyde (up to 30 min). Eggs can be stored either in small plastic tubes, loosely plugged with cotton wool, or in small plastic bottles having perforated lids. Reagent–grade sodium chloride as saturated solution may be used to maintain 75%–77% relative humidity. Continued supply of nectar plants for the adults and food plants for the larvae are essential for butterfly–farming. As caterpillars are highly voracious, they may finish off the host plants in a short period, and therefore, sufficient quantity of host plants should be available in the feeding chamber. Larvae can also be reared on artificial diet. The larvae, when fully mature, undergo pupation by attaching to a substratum with the help of fine silken filaments. After hardening, the pupae may be transferred to an emergence cage or to a pupal rack. They may be surface–sterilized using 2%–5% sodium hypochlorite solution to avoid microbial infestation. The adults that emerge can flutter within the hatchery until the wings become hardened, after which they may be maintained in the butterfly–release area provided with nectar and oviposition plants for mating. Important factors to be considered while choosing nectar plants are the feeding preferences of the butterfly species and the length and timing of flowering. Lycaenids and pierids with short proboscis prefer smaller flowers (e.g. Compositae). Larger papilionid butterflies prefer flowers having a long pistil such as Hibiscus, Ixora, and Clerodendrum capitatum. Species such as Clerodendum capitatum, Cuphea, Marigold, and Ixora species, which flower almost throughout the year, are the commonly–used plants in butterfly farms. Adequate number of nectar plants in bloom should be maintained in the butterfly–release area. When there is scarcity of flowers, artificial feeding may be attempted. Usually, sugar/honey solutions (10%) are presented as soaked pads of cotton wool or in a tube fitted with a coloured corolla. Butterflies often have strong species–specific colour preferences. As these colour preferences may change with age, it is important to provide a wide range of flowers. When given a choice of abundant floral and artificial nectars, butterflies show a preference for the natural substance (Calvert 1990). Moreover, for display purposes, it would be more appealing to observe butterflies exhibiting their natural feeding behaviour. Some butterflies show preferences for substances such as fruits, berries, sap, dung, and carrion. Rotting fruits, to which about 10% honey or toddy is mixed to allow fermentation, are ideal to get the species attracted to the fruits. For many species, use of mud or sand mixed with salt or animal excreta are important for mud puddling. The most common cause of failure of Lepidoptera captive–breeding programmes is the inability to secure pairings and fertile eggs. Most of the butterflies require a suitable environment for the display of elaborate courtship behaviour. Suitable dimensions for a flight arena relate to the wingspan(x) of the species as: length 20–25 x, height 10–15 x, depth 10–15x. Large cages are to be avoided as some species tend to disperse to the roof and sides, and ignore potential mates. The presence of the larval host plants within the rearing cages pstimulates the pairing in many butterfly species. The principles emerging from scientific research into ecology have led to the view that it is impossible to conserve a species in its wild state without conserving the whole environment. For reasons mentioned above, current conservation strategy gives priority for protecting the entire ecosystem than single species. Butterfly gardening is an approach that partially fulfils this aspect of conservation. Such farms also serve as centres of conservation and awareness creation among the younger generation. However, the approach is different for a single species, which is in danger of extinction. In such cases, direct and immediate actions are required to identify the causes of the threat and to modify the conditions that endanger the species (Sbordoni and Forestiero 1985). Captive breeding and reintroduction of stock in the wild is a method adopted in such cases. Captive–breeding programmes have been successfully adopted for a number of species such as the heath fritillary Melicta athalia, the large copper butterfly Lycaena dispar, and the swallow tail Papilio machaon britanicus. Sbordoni V and Forestiero S 1985 Butterflies of the World, (ed) A Mondadori, New York: Time Books. Dr. George Mathew is Emeritus Scientist in the Forest Health Division of the Kerala Forest Research Institute in Peechi, Thrisur, Kerala. He is widely traveled and has been trained in the UK, Australia and Malaysia on a variety of entomological programs such as Specialty Insect Identification, Landscape Ecology, Ecologically Sustainable Tropical Forest Management etc. He is a former Fellow of the Royal Entomological Society of London and a life member of the Association for Advancement of Entomology in India. In addition, he is associated with numerous organizations devoted to biodiversity conservation particularly of butterflies, insect pest management in forest plantations, warehouses etc. He has also authored many scientific papers and reports. His expertise is vast and touches upon many significant areas that have gained urgency and topicality in recent times, such as Environmental Impact Assessment, Biodiversity Monitoring & Measurement of Terrestrial Ecosystems, setting-up of Bio-parks, Butterfly Gardens & Butterfly Houses and the Upkeep of Biological Specimens & Collections etc. He has been selected as the “Green Hero of Conservation” in recognition of his contributions on the in situ conservation of butterflies by CNN-IBN in 2008 and his activities were telecasted in a nationwide broadcast. In 2009, he was selected as the “Green Hero of the South” by Jade Magazine from Hyderabad. Dr. Elizabeth George is a horticulturalist, based at GKVK, University of Agricultural Science, Bangalore. She has worked on post-harvest technology related to plantain for her M.Sc. and on poly-house propagation of Gerbera for the PhD.